Chichester Festival Theatre’s smash-hit production of Half a Sixpence transferred to the West End’s Noel Coward Theatre in October 2016, earning rave reviews from audiences and critics alike. A new stage adaptation of the popular musical, Half a Sixpence is based on H.G. Wells’ semi-autobiographical novel Kipps: The Story of a Simple Soul. Following an orphaned draper’s assistant, this toe-tapping musical is a riotous rags-to-riches story featuring a stellar score. When Arthur Kipps unexpectedly inherits a tidy fortune, he is propelled into a world of high society quite unlike his humble upbringing. As he grows into a man of new means, his childhood companion Ann Pornick is forced to watch as Arthur receives attention from the beautiful Helen Walsingham. Both of the women are in love with Arthur, and he soon learns that he has to make the right choice to have the life he wants. Charlie Stemp stars as Arthur Kipps, receiving five-star reviews from critics and earning a WhatsOnStage Award and Olivier nomination in the process. Further cast members include Devon-Elise Johnson as Ann Pornick, Ian Bartholomew as Chitterlow, Emma Williams as Helen Walsingham, Vivien Parry as Mrs Walsingham, Jane How as Lady Punnet, Gerard Carey as James Walsingham, Matthew Dale as Hayes, Bethany Huckle as Flo, Sam O'Rourke as Buggins and Callum Train as Pierce. Directed by Rachel Kavanaugh (Love Story), Half a Sixpence features a book by Julian Fellowes, with music and lyrics by George Stiles and Anthony Drewe. The musical also features choreography by Andrew Wright, design by Paul Brown, lighting design by Paule Constable and sound design by Mick Potter. 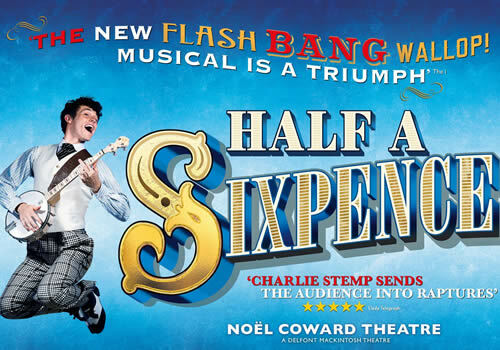 Featuring well-known songs such as “Flash Bang Wallop”, “Pick Out a Simple Tune” and “Half a Sixpence”, the musical plays at the Noel Coward Theatre. Half a Sixpence is suitable for those aged 7 and up. Please note that the theatre will not admit those under the age of 5.